In For Of, Inc.’s Olam Ubuntu Youth Leadership Program involves Jewish and African American youth, ages 13-15, who participate in a joint coming-of-age educational program that fosters a sense of commitment to history and humanity. The youth explore together Jewish and African religious teachings, traditions and culture, and their personal and academic goals. 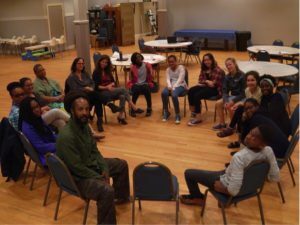 Located in Baltimore, the program takes its name from the Hebrew word for “world” (Olam) and the Nguni Bantu word that translates to “I am because we are” (Ubuntu). The Olam Ubuntu program encourages youth to build a new community, a new world founded in the combined cultural identity, and understanding of the group. Specific objectives of the program include relationship building among the youth, knowledge of conflict resolution, improvement of youth’s speaking and listening skills, identification of social justice issues, improvement of decision making skills, and evidence of local community support. A pilot program was launched in February 2017 and included Jewish youth who attend Beth Am Synagogue’s Discovery Lab. In 2017-2018, the program will launch its first full year of operation and will expand its geographic reach to include both Jewish and African American youth across Baltimore. The Gendler Grapevine Project enables In For Of to implement a Sunday field trip series for the youth.